When you visit us, we check each tooth in your mouth to ensure its health! Our teeth are the hardest substances in our body. Besides being the first step in the digestive process, our teeth play an important role in our ability to speak. We have four different types of teeth. Each type serves a particular purpose for eating and chewing. Incisors— Most adults normally have eight incisors (four upper, four lower). These are the front-most teeth used for cutting food. These are the teeth that appear first in young children. 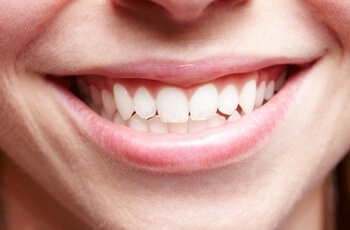 Canines— These are the slightly pointed teeth situated on each side of the incisors. Because they resemble the fangs of a dog (canine) they acquired that name. Sometimes they are called cuspids or “eye teeth,” because they sit directly below the eye sockets. Premolars— These are located between the canines and the molars in the back of the mouth. Premolars have two pointed cusps on their biting surface. Which is why they are sometimes referred to as bicuspids. The premolars are considered transitional teeth, guiding food from the canines to the molars in back for chewing. Molars— Molars, in the back of the mouth, are used for grinding our food. The typical adult has twelve molars. Each side of the upper and lower jaw has three molars. These are our largest teeth and designed to sustain the force used for chewing, grinding and clenching. To enhance communication and improve efficiency among dental professionals, a numbering system assigns each tooth a number. So, instead of referring to the “upper left canine” we use a number. Australia uses the two-digit FDI Dental Numbering System. Canadians use the ISO/FDI system developed by the World Health Organization. And U.S. dentists use the Universal System, whereas dentists in the UK use the Palmer Notation Method.